so is that another fake 'news organization' like fake mag covers that in reality are paid for ads? did you expect anything other than fake from Dr Ruja ??? 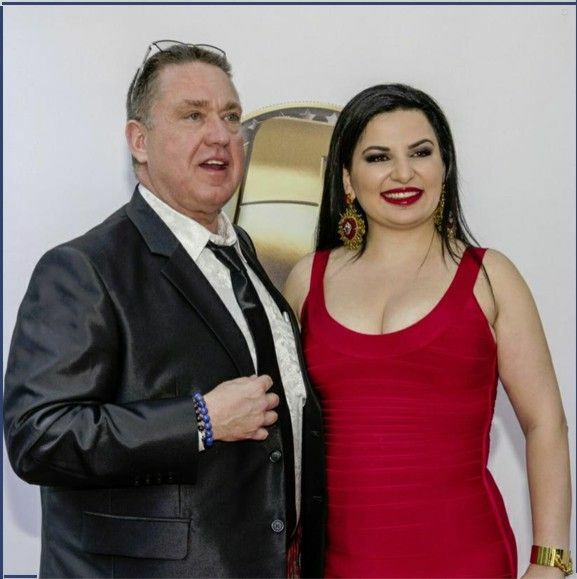 Allan, the ex-president of OneCoin, has meanwhile previously been implicated in similar pyramid schemes to OneCoin, namely Crypto888 and Brilliant Carbon. For the visually inclined, a second construction site video of how onecoin ends. well, just the fact there are allegedly 50,000 members but only 229 invited shows what a liar he is. why wouldn't all members at least be invited? Plus he's still pushing the 'Forbes cover' lie that's been exposed across the web. Thanks for this Ribshaw. I have read the article, and enjoyed all the comments on it in particular. I note that the same old stuff came up in response: that the author if the article is allegedly into Bitcoins and therefore not to be trusted, that he is only trying to drive traffic to his own blog, that they've been audited and given a glowing report, well, we all know the rest. 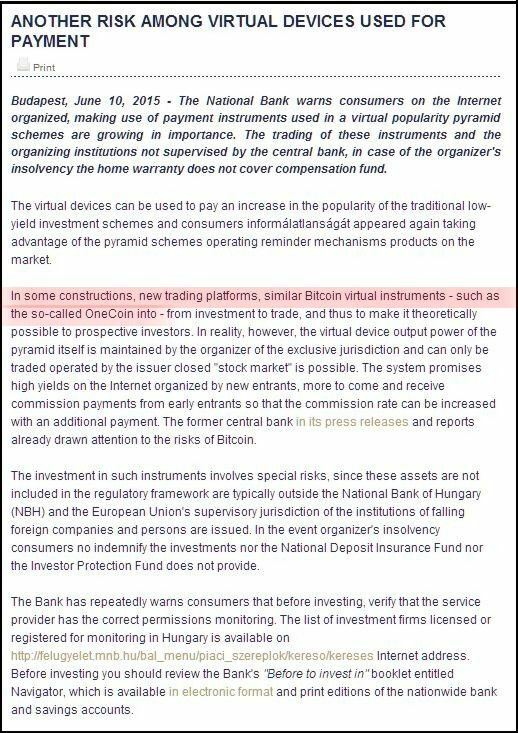 I know nothing about crypto currencies, they are too complicated for me, but something about this whole Onecoin thing just doesn't seem right to me. And I'm not into Bitcoin and don't have a blog that I want to promote either. As for "Dr Ruja", is she a medical doctor or an academic doctor? Presumably the latter. I thought you had to have done a PhD to call yourself "Doctor"? If that is the case, can we know where she did her PhD, and what was the subject and title of her thesis? Who was her supervising professor? If she is an Oxford graduate, at which college did she study? When was she there, did she live in the college or live out? Any chance of seeing her graduation photograph? These are fairly basic questions which should be easy to answer, I would have thought. I'm sure she would welcome the chance to put any doubts people may have to rest. CORRECTION: The Magister Juris at Oxford is in fact a postgraduate course. She cannot have graduated from it as a first degree. So can we know where and when she did her first degree and in what subject, please? Why oh why is it same people, in the same old crappy schemes?. Dont they ever learn, its just moving from one scam to the next. Funny how this is now going to be the next big thing, a few months ago it were utokens! Yes, Wayne, it mystifies me as well. I'm fairly new to the RS forum, joined because of Banners Broker about 3 years ago, but I am still learning. I don't know how the experienced people here can stand it, how they don't feel like just giving up and going away. Because it is one thing after another, they never stop; and I know that when one thing falls over, another dozen will be along to take its place. part of the allure is the scammers do half our work for us by joining. then we know for sure it's a scam. I am with you, too much hassle. Have a bank account, have a credit card, have cash, all seem to be working fine. Admittedly I am a late adopter for most things, but problems like theft that occur with Bitcoin have already been addressed in our conventional banking system. Being hacked, or having a credit card stolen is more a foregone conclusion than a what if. Rather just call the bank and get on with my life. Plus who is smart enough to pick an eventual winner out of this mess, Joby?
" There were more than 530 cryptocurrencies available for trade in online markets as of 5 January 2015 and more than 740 in total but only 10 of them had market capitalizations over $10 million." Your questions reminds me of Danny Pang's Trail of Clues - WSJ. Despite his history and an easy to disprove story, people lavished him with cash. Not that a faked resume hasn't happened a hundred times, people never seem to check. That Dr Ruja's 2 and 3 were allegedly involved in previous scams also potent red flags. Meh, I'm sure this all turns up aces. Just toss the work boots in a pile, and on to scam number five. What could possibly go wrong? Joby Has Taken To Writing Like This. Perhaps He Thinks It Makes Him Sound More Important, But In Fact It Is Very Irritating. Plus The Main Problem Is That What he Writes Is Rubbish. his very first sentence contradicts himself. that's precisely what these 'calls' are. Every now and then a scam comes along which is so outrageously over the top one has to question the sanity and common sense abilities of those who participate in it. OneCoin is one of them. What about the other 344,780? Just askin'! And also....if you double 1,380, you get 2,760.....is this some new form of maths that Onecoin is doing here? Hucksters love the split, reminds me of the internet bubble of 99. 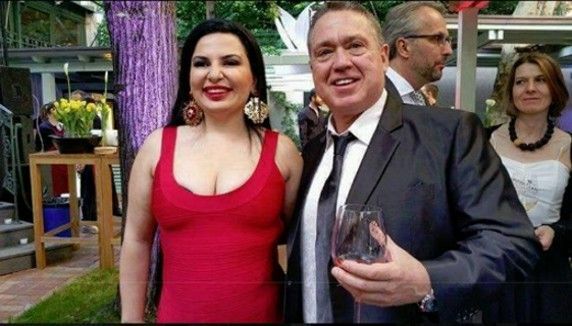 Our new friend, Tania Parsons (once so ardently behind UFUN.....and Dubli....and others no doubt) has thrown her weight behind Onecoin. Watch out USA, Onecoin is coming to you on 4th July. Lucky old you! Glad to see the old Forbes cover is still doing the rounds, even though it has been debunked as an advertising feature for which Onecoin paid. Still, it might convince a few people to join and that's where the wheels hit the road after all, isn't it? You would think people would at least have presence of mind to ask to see a copy of the article, and dare I say even read it before they reach for their wallet. To save you wasting your time looking at it, it's all pictures of her pouting and wearing big frocks. It's a group for people, and I quote, "For those who have studied in Oxford, England under SCIO or some other program, and have fallen in love with all that is Oxford." A SCIO programme is "Scolarship and Christianity in Oxford". It gives you tutorials, access to University facilities, and the right to attend lectures - a sort of visiting student really. Cost about $18,000. Now, why would "Dr" Ignatova who claims to have completed a Masters level degree in Law at Oxford be interested in a little group like this, I wonder? Surely it would be waaaayyyy beneahth her exalted level? 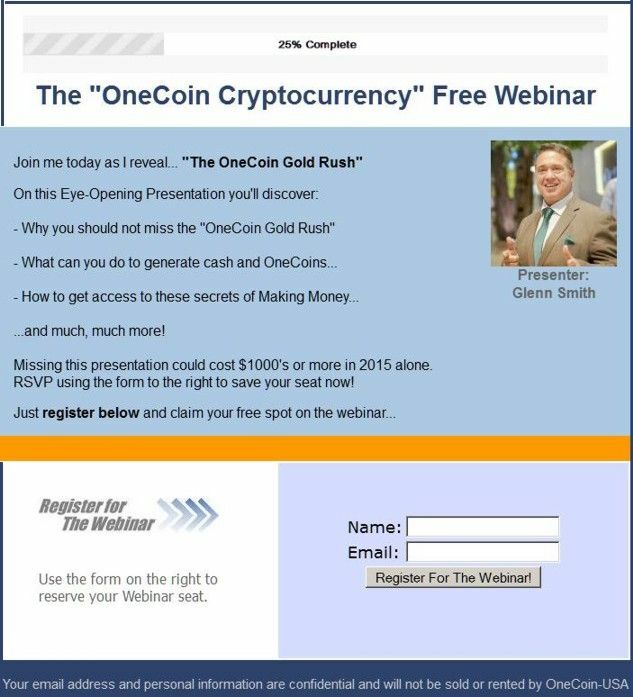 Ahead of the proposed July 4 OneCoin launch, it is being promoted in the USA by Glenn Smith, which should make it easy for the SEC when they go looking.